Fantastical for iPad is a nice upgrade from the standard Apple calendar app and a great speed improvement over Readdle's Calendar app.1 But with all versions of Fantastical, the gestures aren't obvious and most of the utility is hidden to anyone not willing to accost their iOS screen.2 Here are some things I find useful. To jump to a specific date, tap and hold on the date in the header. 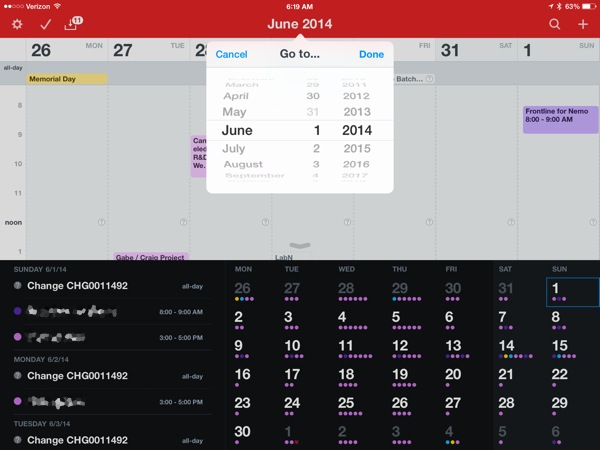 If you want to scan month by month, tap and drag on the month view vertically. This scrolls the month view and jumps the week view to start on the first of each month. 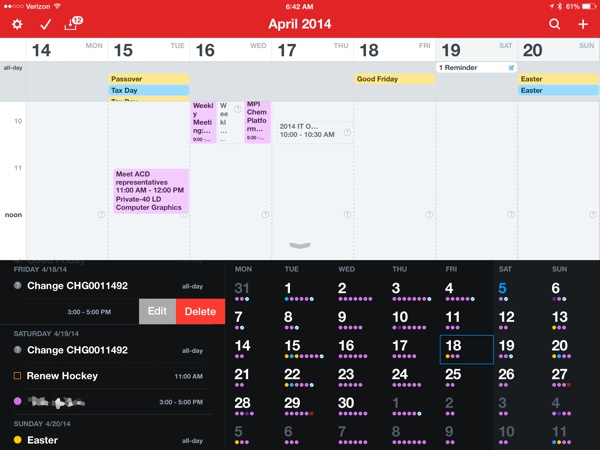 Just like Fantastical for iPhone, dragging up or down at the bottom of the week view expands or contracts the week view. Tap and hold on the day in a month view or the day header in the week view to begin creating an event for that day. Slide from the left edge of the screen to reveal the reminders pane. Slide from the right edge to show the search pane. Slide from right to left on an item in the list view to delete or edit.